This is a handy sized tube of Wasabi paste, ready to use. Wasabi is a Japanese horseradish which can range from dangerously spicy to mildly spicy though it can never exactly be called ‘mild’! 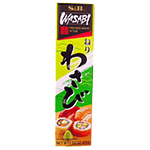 Wasabi is served mixed with soy sauce as a dip, or as a condiment to add to sushi and sashimi. It can also be added as a flavouring to soba, udon and other noodle dishes or to add a Japanese twist to steak, seafood salad and Dim Sum. The bright green colour of prepared wasabi is a great contrast to the colourful dishes of Japanese cuisine. Great value again from the Oriental Food and Gift Store in Zambia.